Hello, this is the latest fanart of VK that i did. Draw for a contest. This is to celebrate VK forum one year anniversary in April. Featuring Zero, Yuki and Kaname. I prefer this kind of colouring style cos it is easier for me. I guess im not the one who uses pen tool only that's why vectoring is hard for me. I spend 2-3 days working on it and 5 more days on editing. This took me a week....I work very slow. I need to train my working speed... Done with Photoshop CS2 with the use of tablet. wow really nice!Yuki look really cute! It looks so alike! It's so beautiful! Aw! It's so cute! Thanks for sharing! Congratulations! It's very well done *-*. I like drawing too, but i'm more.. How does it say? 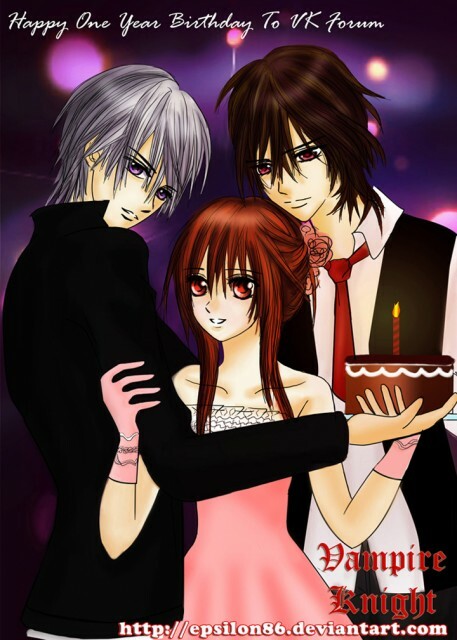 Rarely do you see Kaname and Zero drawn so well in fanart but you did a wonderful job! Zero-Yuuki I love it....Great Work! Oh yeah I love Kaname too.